Why Do Food Labels Use Calories Instead of Joules or Kilojoules? The U.S. standards for food labels call for using "calories." This is actually the colloquial term for kilocalorie, or kilogram calorie. The term calorie refers to a measurement of energy that comes from the French term "calor," meaning heat. Countries in the European Union use kilojoules on their labels, the joules are the standard measurement of energy. However, the use of calories over joules on American food labels is simply a preference -- think of it as the energy equivalent of using "miles" instead of "kilometers." Kilocalories measure the energy in foods. A kilocalorie is the amount of energy it takes to raise the temperature of 1 kilogram of water by 1 degree Celsius. A kilocalorie equals 1,000 "small" calories, which is the energy it takes to raise the temperature in 1 gram of water 1 degree Celsius. On U.S. food labels, the term "calorie" actually means kilocalorie, though a calorie is technically the smaller measurement. Most countries outside the United States use kilojoules on food labels. A kilocalorie equals 4.184 kilojoules. The United States Department of Agriculture's National Nutrient Database lists values for both. Nations that belong to the EU must list both kilojoules and kilocalories. The rules in the United States make listing kilojoules optional. 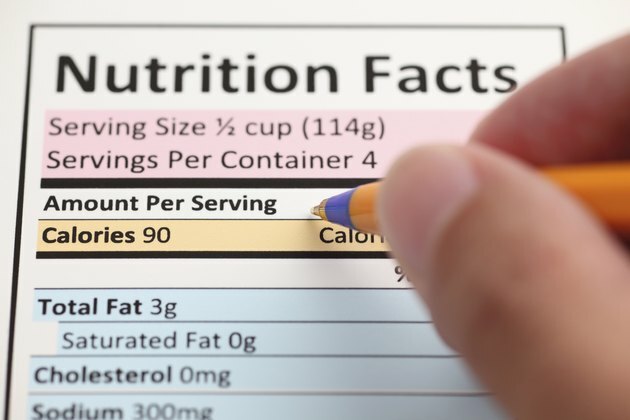 A food's energy content on labels typically is listed for a serving size and for 100 grams. The Atwater system is generally used by the food industry for U.S. labels. This is a standard for calculating the energy value of carbohydrates, fats and proteins. These kilocalories are expressed as "calories." The system assigns 4 calories per gram to carbohydrates, 9 calories per gram to fats and 4 calories per gram to proteins. Under the EU system, carbs and protein are each assigned 17 kilojoules and fat 37. There also are standards used for ethanol/alcohol, sugar-free sweeteners and organic acids. These kilocalories also are expressed as "calories." Ethanol is assigned 7 calories per gram, or 29 kilojoules per gram; sweeteners have 2.4 calories per gram, or 29 kilojoules per gram; and the organic acids have 3 calories per gram, or 13 kilojoules per gram. How Many Calories Are in a Vodka Red Bull? Which Energy Does the Body Burn First During Exercise?